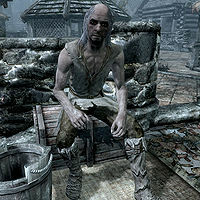 Snilf is a Nord living the hard life as a beggar in Riften. Like the other beggar in town, Edda, Snilf has been given a bedroll in the slums of Beggar's Row and sleeps there every night between 10pm and 6am. After waking up, he heads to the market and finds his usual spot near Marise Aravel's stall. He then spends the entire day begging the townsfolk for money, at times complaining loudly about his situation and how people tend to ignore him because he is a beggar. He wears ragged robes and matching boots. He carries a spare set of ragged robes, an iron dagger, and some lower-class items and gold. He is seemingly angry and bitter about everything that happened to him and will, through his greetings, hint at his sad background story: "Sure, sure. I'm a dirty beggar... why would you want to even speak to me. ", "To Oblivion with all of you! You rich piles of dung walking by us like we're not there! Pretending we don't exist! How dare you! ", "You think you know pain? Do you!? Try watching your wife and daughter burn alive after they've been ravaged by brigands! That's pain, my friend. ", "Edda... she's crazy as a loon, but at least she doesn't have the mind to realize what a horrible world this is. She's the lucky one." and a piece of advice; "Just leave Riften. Go far, far away and never return. This place is nothing but a rotten, stinking corpse that's sat in the sun far too long." "Snilf, it's me. I don't have a roof over my head either, remember?" "Oh if only I could provide more than this coin. I hope it'll do." "Again? Buy some food this time will you?" "Another uncounted causality of war. Here you are, you poor man." "Certainly, my good man. Here." "You're disgusting, stay away from me." "If I had even a pot to piss in, I'd gladly share. Sorry." "Yes, I hope this helps you." "Absolutely. Here you are. Be well." "Ugh, you smell horrible. Get yourself cleaned up." "Oh you poor thing, you must be starving. Come to the temple later and let us feed you." "Snilf, I told you begging isn't the answer. I expect to see you at the temple later." "Sorry, no time. I'm late." "If you want to awaken from your next slumber, I suggest you leave me be." "What? No. Get away from me." "I suppose. Just get something to eat and stay away from the Bee and Barb for a change." "Very well, please use it for food." This page was last modified on 28 February 2018, at 15:10.